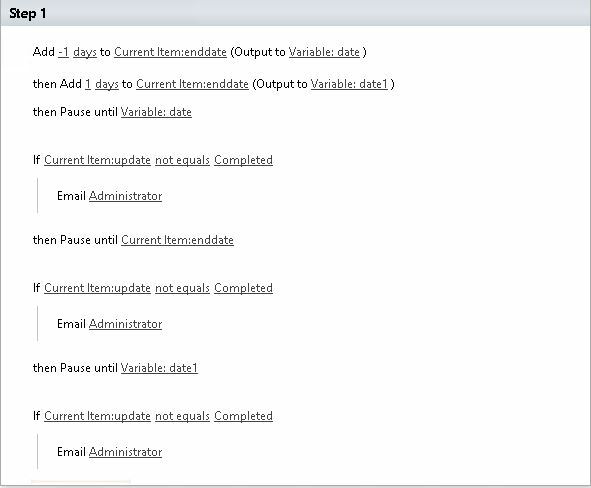 How can I create a workflow using SharePoint designer 2010 to send 3 emails? before due date, on due date and after due date if status not completed. Hello you can edit behaviour of Workflow Task when you click on it. Manual and examples here. Some info here too. You can follow the workflow steps below to send emails at the relevant time. Modify the before due date and after due date, and change if condition with your own task. Not the answer you're looking for? Browse other questions tagged 2010 sharepoint-server workflow designer-workflow email or ask your own question. Add tasks to task list using a workflow and send email 7 days before due date?